Learn which antioxidants help promote a healthy immune system and more! Seasonal changes and holiday stress may deplete your immune system, triggering unwanted symptoms like coughing, sneezing, itchiness, or fatigue. If you’re feeling under the weather, or if someone around you is sick, it may be a good time to reinforce your immune system. Keep reading to learn 10 simple steps you and your family can take to start promoting a healthier immune system. The immune system is a “vast network of cells and tissues constantly on the lookout for invaders.” It is your body’s biggest defense against disease-causing bacteria, viruses, parasites, fungi, and toxins. These substances, also called antigens, can trigger various types of immune response. However, the body may sometimes also misidentify its own cells as foreign bodies, so it’s important for an immune system to stay healthy so it can properly fight off the real pathogens and clear out dead cells without attacking normal, healthy cells. White blood cells (leukocytes) are found in your blood vessels, thymus gland, spleen, and in bone marrow. They seek out pathogens and – once spotted – start to multiply, sending signals to other cells to do the same. Some white blood cells known as phagocytes attack and break down pathogens, while others known as lymphocytes (such as T cells, which coordinate an immune response, and B cells, which make antibodies against illnesses) remember what pathogens look like so they will recognize them if they come back again. 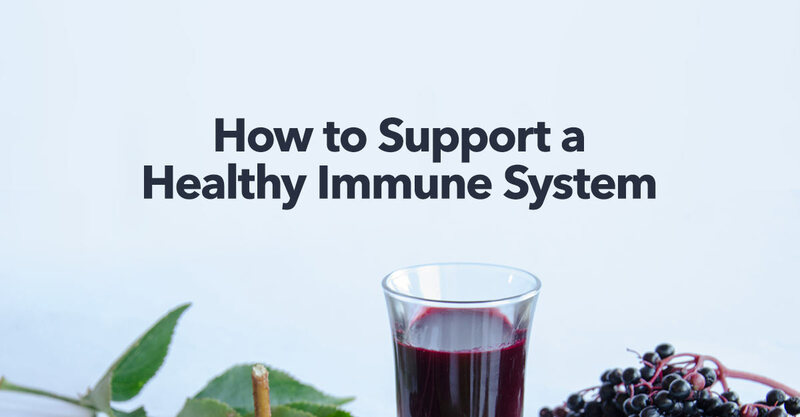 According to Harvard Medical School, these are a few simple ways to support a healthy immune system – most of which also ensure you’re practicing a healthy lifestyle. Cook meats thoroughly and prepare foods properly. Take nutritional supplements for immune support. There are many natural ways to help support a healthy internal response, including by taking supplements of vitamins, minerals, and herbs containing antioxidants. Studies report that echinacea contains active compounds with antiviral and antioxidant properties. To support a general healthy internal response and to temporarily relieve minor cold and flu symptoms, try echinacea tea, such as the certified organic Immuni-Tea by Oregon’s Wild Harvest, or try a form of the herb in liquid extracts, capsules, chewable tablets, or softgels. Elderberry is a flowering plant with small dark purple berries that contain helpful plant-based antioxidants for immune system and upper respiratory health support, helping to guard cells against free radicals and inflammation. Sambucus elderberry gummies are a popular (and tasty) way to take this herb. Try gummies for kids by Nature’s Way or regular gummies for adults. You can also try Sambucus elderberry syrup for immune support by a trusted natural health brand such as Gaia Herbs, available in formulas for kids or adults, containing NO artificial colors, flavors, or preservatives. The leaves of this ancient tree contain antioxidants that are believed to support immune system function, normal mitochondrial function (how cells produce energy), eye health, brain health, and more. Ginkgo biloba is for use by adults only and is available in various types of dietary supplements, including veggie capsules, extracts, and more. Taking a vitamin C supplement such as the bioavailable Lypo-spheric Vitamin C by LivOn Laboratories helps protect cells when exposed toxins and free radicals. This essential antioxidant is also naturally found in red peppers, apples, oranges, and broccoli. This essential mineral for the human body supports the immune system during stress, as well as plays an important role in enzyme activities, tissue synthesis, energy metabolism, and the functions of the gastrointestinal, skeletal, reproductive and central nervous systems. To help shorten the length and severity of cold symptoms, take a zinc supplement such as hypo-allergenic Zinc 30 capsules by Pure Encapsulations to promote your body’s natural defense system. How do you support a healthy immune system? Share your tips in our comments section! A Midwest-raised journalist living in Nashville, Tennessee, Leslie is an organic food and natural health advocate who has traveled the world to find the best chocolate and craft beer. When she’s not at the local coffee shop or farmer’s market, you can find her writing songs and caring for her ferrets.